Glenn Korzin is a bassist, guitarist, performer, and educator (currently offering private music lessons since 2005 on guitar, bass, and piano). Glenn is experienced in multiple styles of music including: Rock, Soul, Funk, Blues, Hip-Hop, Reggae, Country, Pop, Folk, Electronic and Jazz. His principal instruments are the electric bass and the acoustic upright bass. He also plays electric and acoustic guitars. Born in 1985, Glenn was raised in the Garden State. Taking piano lessons at a young age sparked an interest in music that bled into on and off experiences with music grade school and high school. He formed a band in high school with friends and brother Alan Korzin, heavily influenced by progressive rock bands. The band broke up while Glenn was in college, but the interest never faltered in composition, arrangement and leadership. He began playing guitar at the age of 13, and later experimented with various percussion instruments, the bass guitar, piano, and most recently the upright bass which he started studying in 2011. Glenn is currently residing in Gettysburg, PA where he is working as an Innkeeper and restoring an old farm house. Musically, Glenn is currently working on his solo performance skills, and working on his original music - offered free for your listening pleasure on this very website. Please click here to listen to Glenn's original music. More original music will be posted as soon as it feels right to post for the world to hear! 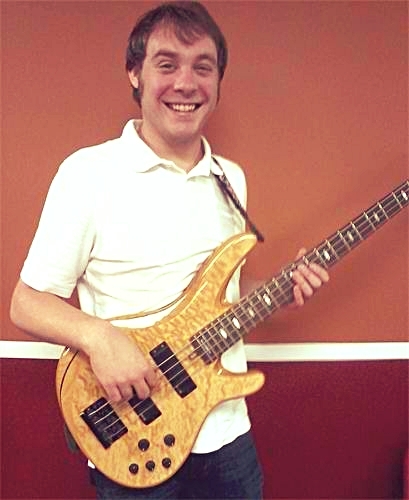 Glenn offers private lessons on guitar, bass, and piano. Please click here for more information concerning private lessons. You can catch Glenn performing on the FIRST FRIDAY of EVERY MONTH at Boyer's Wine Room located at Boyer's Nursery and Orchards (facebook.com/boyernurseries). He will perform acoustic covers, take requests, and throw in the occasional original song. Drop by, have a glass, or two, or three, of wine and sing-a-long! Please feel free to contact Glenn directly for more information CLICK HERE.